Shawn McClain’s Sage may be the most significant restaurant to open in Las Vegas in the past three years. As good as Twist by Pierre Gagnaire is, it is, in the end, a restaurant that challenges the diner. Sage serves up cuisine that is every bit as hyper-delicious and creative, but with a Midwestern sensibility that makes it more approachable for non-foodies as well as curious and demanding gourmands. McClain made his mark in Chicago with Spring and Green Zebra, where he proved himself an innovative master of mixing culinary metaphors. We don’t know the politics (yet) behind his move to Vegas, but we do know he’s committed himself to being in the restaurant and our humble burg for the next six months, to ensure Sage will continue to burnish his considerable culinary chops. The significance of Sage is what it might mean for our culinary future. As much as we love the contribution such heavyweights as Daniel Boulud, Alain Ducasse, Mario Batali, Joel Robuchon, Emeril Lagasse, Wolfgang Puck and Guy Savoy have made to our culinary scene, their presence here has never been, and will never be, anything more than ephemeral. McClain’s (hoped for) success represents something much more important — creating an environment for creative chefs who aren’t Food Network or Michelin stars to come here and ply their trade to an appreciative audience. Like Julian Serrano, Alex Stratta, Paul Bartolotta and Rick Moonen before him, he is helping to break the strangle hold absentee “celebrity” chefs have on Las Vegas. All of them have sustained and enhanced their fame for being part of our gastronomic fabric — not just fly boys who drop in whenever their management contract tells them to. Obviously, we at ELV wouldn’t be so hopeful if Sage’s food wasn’t drop dead delicious. And so it is. You enter the over-sized bar with the super-high ceilings and immediately notice how generous the space is. No overcrowded tables here — no matter where you sit, you have a sense of privacy. And the acoustics are wonderful — all conversation is soft and muted, much like the flattering lighting. The first issue you’ll have will be to resist the impulse to just hang out at the bar. So spacious is it, and so interesting the bar food and beer list, that you might find yourself nibbling away for hours at such menu gems as Vancouver Island kusshi oysters dotted with a piquillo pepper/tabasco sorbet, sharply seasoned wagyu beef tartare, sinfully rich oxtail and beef marrow crostini, or (our favorite) sweet and sour sweetbreads. Called “crispy sweetbreads” on the menu, they arrive looking like bumpy mcnuggets of any old white meat, if that meat was succulent and sweet and melted in your mouth. Coated with a Banyuls/vinegar sauce, you won’t be able to stop eating them. If you told Aunt Edna they were chicken, she’d be fighting you for the last morsel. Standing toe to toe with all of these is solid charcuterie (don’t miss the La Querica speck), and what is sure become McClain’s signature dish: foie gras custard brulee. Combine the silkiest dessert on the planet with the creamy, umami overtones of good foie, sprinkle with cocoa nibs, and serve with a heavenly salted brioche, and voila! — you have another menu item Aunt Edna will love as long as you don’t tell her what’s in it. Each of these will tempt you before you get close to the main dining room, as will uber-beer guy (and sommelier) Mike Shetler’s assortment of craft brews on tap and in bottles. Shetler spent ten years as GM at Rosemary’s, and as much as we hate to see him leave the neighborhood, his upmarket move bodes well for him and Sage. He is a master at matching beers and ales with food, and one of the great experiences here is tucking yourself into the bar and letting him do just that. If you can resist the gauntlet of fine food and drink at the bar, the equally dramatic main room awaits, where some of those same dishes are available as starters. We could wax poetic for days over McClain’s yellowtail crudo with pine nut foam in black truffle jus — an odd combination of earth, sea, and tree that haunts you with its interplay of flavors — as well as his sheep’s milk ricotta gnocchi that almost disappear in your mouth before you bite into them. We’re not sure gnocchi can get any lighter than these without becoming a foam. McClain brings all this puffy fluffiness back to earth by accenting the weightless dumplings with spaghetti squash, a riesling reduction and bits of preserved lemon. A simply spectacular display of vegetarian inventiveness. Less successful are two items that may not be long for this menu: smoked Columbia River sturgeon and escargot and pork belly agnolotti. The agnolotti can only be called a noble failure — a combination that just doesn’t work — sorta like Jay Leno at 10:00 o’clock, or Jodie Foster and Mathew McConaughey in “Contact.” Escargot are like Jodie — they need to left alone — at least by something as masculine as pork bellies. As for the sturgeon, chefs are always trying to get us to like it, but this bottom feeder needs to be smoked more and sliced thinner before that happens. You are better off dabbling in some thin-sliced wild mushrooms laid atop warm Robiolo cheese and dressed with an aged sherry vinaigrette, or a runny, organic poached egg begging to be violated by a piece of toasted bread. The Food Gal® consistently says that apps are invariably more interesting than main courses in most restaurants, and by and large we agree with her. But it’s pretty obvious McClain lavishes the love on Spanish Iberico pork loin “garnished” with pork shoulder cannelloni and braised romaine, and roasted turbot with clam and lemon risotto. We’re not fans of baby food, so the butter-soft veal cheeks aren’t something that had us swooning, but that being said, both times we’ve tried them they were packed with a beefiness veal usually doesn’t achieve without superior braising. Something we are fans of is dessert. One of many smart moves made by McClain was in bringing pastry chef Lura Poland over from Restaurant Charlie. Poland worked under 2008 Pastry Chef Of The Year Vannessa Garcia at RC, and while her desserts here aren’t as free-form and avant-garde, they are every bit as lip-smacking. As taken as we were with her Valrhona malted milk chocolate dome (tasting like a soda fountain drink with a higher education), and her roasted pear tarte tatin (with a surprising, sharp, tangy and sweet blue cheese ice cream), it was her very un-American canelles (sic) de Bordeaux that truly captivated the table. These difficult-to-make tiny cakes appear almost burnt on the outside and are soft and custard-y within. 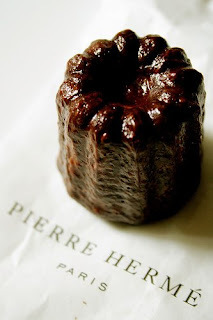 We fell in love with caneles de Bordeaux on la Rive Droite de Paris a decade ago when we stumbled upon a patisserie that specialized in dozens of variations of them. Poland tops hers with a nice white chocolate sorbet and a rum sabayon, and the only fault we could find was that she didn’t put three or four more of the little buggers on the plate. Enough with the Food Gal stuff. You ripped that off from Bill Simmons’ Sports Gal. Trademarking someone else’s idea is not really cool at all. You are not clever or entertaining. Excellent review ELV. I had to chuckle a bit at your comments on the Sturgeon dish–it reminded me of your turn as a judge on Iron Chef America. I’ll never forget that incredulous look on the face of Chef Symon when you dared to criticize his treatment of the mighty sturgeon. How dare anyone attempt to challenge the mighty Chef from Cleveland who, in the eyes of many of the wags at Food Network can do no wrong. The sturgeon is a fish that is difficult to work with in the kitchen and many of us who live within earshot of the Columbia River where it dwells prefer it just simply smoked. We don’t care about serving it with foams, seaweed, hams, clams or yams. For those of you who are sadly misinformed, or merely uninformed, the Food Gal has one of the more perceptive senses of taste and cuisine in town and has the ability to balance and counter the opinions of ELV and others–a rare and valuable talent indeed when it comes to offering a balanced restaurant review. I believe the pastry chef’s name is actually Lura Poland. Alexanbo is correct. The Pastry Chef’s name is indeed “Lura,” not “Laura.” Don’t worry, I made the exact same mistake. wow thats a shitload of animal innards and just plain gross parts. bone marrow, neck meat, oxtail, foi gras brulee? Jesus christ I thought the decade of excess was over. way above my palate grade. For those who can, enjoy. Impressive review ELV- you are officially Big Time. Whats wrong with sturgeon outside the deli case? Bradley Ogden (when Bradley was in the kitchen) created an apple cider gastrique preparation that matched quite well with my glass of Chateau d’Yquem. Thanks for another in-depth review, John. This place looks great. Seems that Aria WILL have a few gems that make it not a clone of the Bellagio restaurants. You must have a stomach of steel my friend and I must avoid reading when hungry with your great photo shots. Are they taken in the kitchen? Let’s not forget Chef Luciano Pellegrini as one of the non “celeb” chef crew who came to Vegas (he did so in 1999), cook here, live here and win awards HERE (he won his James Beard Award in 2003 – from behind the stoves at Valentino at the Venetian). I think McClain is one of the most talented guys in the country – had the opportunity to meet him at the JBF Taste America Las Vegas event in Oct 2008 and ate at his restaurant, Custom House, in Chicago this past summer. Am very much looking forward to tasting the goods at Sage – which along with Twist – was the restaurant I was most excited to have open in Vegas. PS – Bill Simmons is a less-than-average sports personality that files for ESPN’s Page 2. He’s a Boston sports homer and one of the most grating guys in the biz. Well, partner Piero Salvaggio already was a “celebrity chef”… And rightfully earned that title with Valentino in LA. But nonetheless, Luciano Pellegrini really made Valentino into more than just some LA clone on The Strip, but a true culinary heavyweight in its own right. And yes, I’m also excited about Shawn McClain coming to town! While it’s been great to see how “The Food Network Gods” revolutionized our dining scene, and then how “The Great French Invasion” revolutionized it again, it will be nice to see more chefs like McClain come to Vegas, stay here, and build a restaurant that’s less of a clone of something else and more of something that we can truly call our own. After reading the reviews here, I decided to try Sage last evening and to say that I was utterly disappointed would be the understatement of the month. The three of us ate as appetizers the Agnolotti, Egg and Oysters. The Oysters were excellent but the egg and agnolotti desperately needed salt. My main problem was with the entrees. My guest’s Veal cheeks were very tasty and hot. However my pork loin and my other guest’s Wagyu tenderloin were served borderline cold . The meat on both plates was cooked to visually appropriate doneness yet was cold inside with a small area of warmth on the outside ring of the meat. I tried to press my sliced pork loin onto the hot plate to heat it up a little but even this wasn’t enough. I complained to the waiter who brought both plates back into the kitchen, and after putting both portions on perhaps a flat top to reheat them, brought us back the same partially eaten, now over cooked, meat served with the exact same half eaten sides that had by this time become cold as well. So, now we both ate overcooked meat and cold sides. We left without ordering desert and finishing our wine. I don’t enjoy saying bad things about a restaurant, however after spending over five hundred dollars at this restaurant, I should at least expect to receive hot food. On a side note, the wine service was excellent but not enough to make up for the sophomoric errors from the kitchen ( the chef was in house too) Perhaps he should be inside supervising the line instead of mingling with the guests outside. I will not be returning to this establishment. I’ve been twice – without a doubt the best total restaurant experience I’ve had in Vegas in recent memory – or anywhere else for that matter in the last few years. The design of the restaurant is spacious and gracious – your not crowded in and feeling like a sardine. The design is soothing and comfortable – not over the top but elegant. The food? Even an ordinary strip steak is something special when Shawn puts his magic touch to it. Every dish we had on both occassions – was outstanding. I’m singing the praises of this talented chef to everyone I meet. May Sage have a long long run. I’ll be back with a party of 8 in January. For a rhinoplasty you want to wait until your face has finished its growth. In general that will be around 14 for females. Your doctor would continue to measure your height over time, and if you haven’t grown in a while, you are probably finished growing.